Something to say… | Families for HoPE, Inc. There are times when I sit in front of a blank screen hoping for something profound or inspiring to write about, and nothing comes to me; therefore, I have nothing to say. Of course, I think it’s actually that I have something to say; I just don’t know how to say it. At the HPE conference in 2008, I met then 17 year-old Robert from New York. 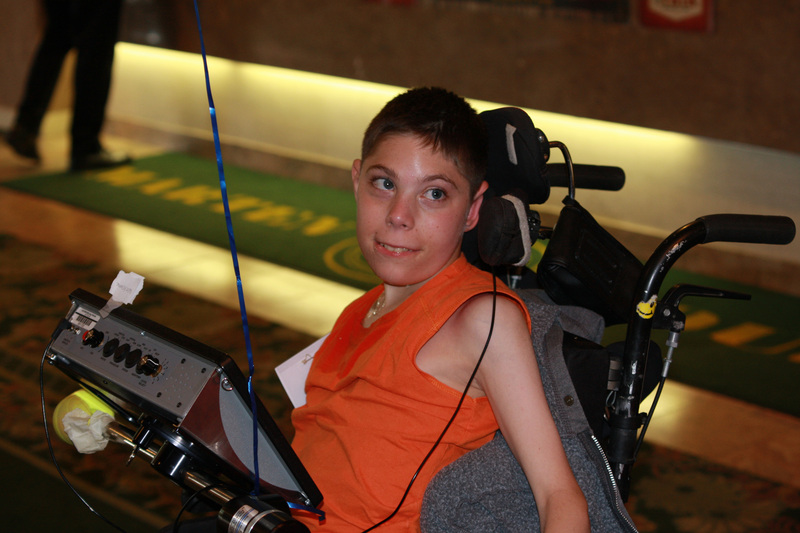 Robert didn’t speak verbally; however, he used an augmentative communication device to help him communicate. Because he didn’t have good control over the movement of his hands and arms, Robert activated the device by moving his head to his left to press a special switch attached to his wheelchair. Robert gave me an awesome demonstration on how the device worked, and I was so impressed. Contained on the device were pre-recorded messages, phrases, and words; many of them were recorded using a masculine voice whenever possible because what 17 year-old boy wants his voice to sound like his mother’s? Visually, the top of Robert’s device contained words or pictures to represent the various words and phrases available. It was set up in a grid with 4-5 rows down and probably 8 columns across. Each square of the grid contained a little light, and Robert would watch as the device would light up each row. When the appropriate row was lit, Robert would turn his head and select that row. Then, the device would scroll through each square in that row and when the light came on at the appropriate word or phrase Robert wanted to say, he would turn his head to activate the switch. With that movement, the device would activate the pre-recorded word or phrase. Words, phrases, and sentences could also be added and recorded as needed to suit the situation. Thankfully, Robert was patient with me. At first as he demonstrated the device, I would try to fill in the blanks of what I thought he was trying to say, but I didn’t always get it right. Finally, Robert activated a pre-recorded sentence that said, “It’s my turn to talk now!” I think my eyes bulged out of my head and my jaw dropped open when I realized that my friend Robert was politely telling me to “just shut up and listen”! In that moment, I realized that Robert didn’t need me there to fill in the blanks; he communicated just fine on his own using all of his skills and abilities. He knew what he wanted to say, and he knew how to say it. There is a song by Matthew West entitled, “Something to Say”, and every time I hear that song, Robert comes to mind. In those moments when I sit in front of the empty screen thinking that I have nothing to say, I think of Robert and what he would say if given the opportunity. Even though he is unable to speak, he certainly has something to say.